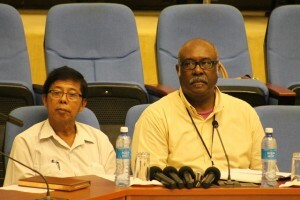 Chairman of the Guyana Geology and Mines Commission (GGMC), Stanley Ming and Acting GGMC Commissioner, Newell Dennison. The Board of the Guyana Geology and Mines Commission (GGMC) has recommended temporary closure of that entity until the environment is scrubbed of all mercury residue and the Guyana Gold Board (GGB) removes the laboratory that emits mercury while burning gold being bought from miners, a top GGMC official said. Chairman of the GGMC’s Board of Directors, Stanley Ming said the board agreed to the recommendation on Thursday and it has since been dispatched to the Minister of Natural Resources, Raphael Trotman for a decision. “The Board’s recommendation is that we shut it down until such time as they can make alternative arrangements to do the burning of the gold at another location. That’s recommendation but the final call has to be made by the minister,” Ming said. The GGMC’s Board Chairman said he had no idea where the GGB’s laboratory could be relocated to and that was a matter for the government. Ming said the GGMC workers would have to decide their next move if the minister and management do not agree to temporarily shut down the GGMC’s operations. He said the closure should allow for the environment to be “scanned and given a clean bill of health because there is residual stuff there from what I can imagine”. “The whole idea is that the laboratory has to go. It’s not ideal to have that in a closed environment with people working and living in the area,” he said. More than 60 GGMC workers have been tested positive with high levels of mercury in their blood, due to above normal emissions by the GGB’s laboratory. Those workers have since been sent on leave and ordered by doctors to take prescribed medication and vitamins to eliminate the potentially deadly chemical from their bodies. For its part, the GGB has said that tests done by the Trinidad-headquartered Kaizen Environmental Services have shown significantly reduced levels of mercury in and around the GGMC’s buildings in keeping with United States Occupational Health and Saefty rules. The GGMC and GGB are housed in one compound at Upper Brickdam, Georgetown.